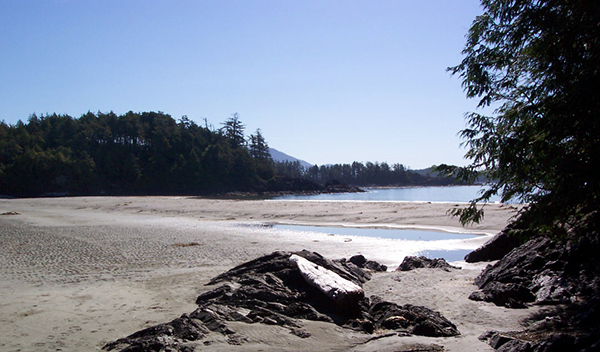 Due to its close proximity to Tofino, Vargas Island Provincial Park in Clayoquot Sound is a very popular paddling and wilderness camping destination. Visitors also come here for the exceptional wildlife viewing opportunities offered, including the chance to see Gray whales in the area around Ahous Bay. Naturalists are drawn to this area every spring as the Gray whales pass by the island on their way to summer feeding grounds in the Arctic Ocean and Bering Sea. Vargas Island Provincial Park protects the rugged western portion of Vargas Island, Blunden Island and the tiny La Croix Group of islands immediately northwest of Tofino. Much of the island is relatively flat and its interior features a number of bogs. Marine features including exposed rocky coast, sandy beaches, sheltered channels and bays, an intertidal lagoon and mudflats are all protected within the park’s boundaries. The park is also home to ancient sand berms – rows of crescent-shaped sand mounds that indicate earlier sea levels. The park area also includes the Cleland Island Ecological Reserve, home to a great diversity of nesting sea bird colonies including the Rhinoceros auklet, Cassin’s auklet, Pigeon guillemot and the Black oystercatcher. Access to the Ecological Reserve is prohibited, as the breeding seabirds are very sensitive to disturbances. Park visitors are advised to not bring pets to Vargas Island or Flores Island. Dogs are a high level attractant to wolves and other large carnivores. Protect your pet – keep them at home. The historic 3-km telegraph route that runs East to West is not maintained and some bridges are out. The rough route passes through various jurisdictions including some private property. Numerous kayak companies under Park Use Permits offer day and multi-day kayak tours to Vargas Island Park. For water taxi service to the park, contact Clayoquot Connections at 250 726-8789 or Tofino Water Taxi at 250 725-8844. Vargas Island Provincial Park is located immediately northwest of Tofino and west of Meares Island on the west coast of Vancouver Island. The park is accessible by boat from Tofino. Small planes can land on the beach of Ahous Bay. Nearby communities include: Tofino, Ucluelet, Ahousat, Flores Island. Cultural Heritage: A number of Nuu-chah-nulth First Nations heritage sites are located within the park. Conservation: The park protects the rugged, outer coast of Vargas Island, Blunden Island and the marine environment. Many marine features are represented in the park, including exposed rocky coast, sand beaches, sheltered channels and bays, a lagoon and mudflats. Gray whales migrate through the off-shore waters. The park also encompasses ancient dune berms, rows of crescent shaped sand mounds that indicate earlier sea levels. Vargas Island Provincial Park includes the Cleland Island Ecological Reserve, which is home to a variety of nesting sea birds including the Rhinoceros auklet, Cassin’s auklet, Pigeon guillemot and the Black oystercatcher. Access to the Ecological Reserve is prohibited. Due to its scenic values and close proximity to Tofino, Vargas Island is a very popular paddling and camping destination. Gray whales frequent the Ahous Bay area and the La Croix Group of small islands is a peaceful spot for paddling, bird watching and viewing seals. Kayakers can launch at the First Street Dock in Tofino. Canoeing is not recommended. The waters of Clayoquot Sound may contain a variety of fish species, including salmon, rockfish, halibut and lingcod. One of the more popular areas is around Wilf Rock at the southern portion of the park. Fishing is permitted as per provincial and federal fishing regulations. All anglers should check the current regulations issued by Fisheries and Oceans Canada prior to fishing. Anyone fishing or angling in British Columbia must have an appropriate licence. Exellent beach hiking can be found on the outside beaches of the park. There are opportunities for ocean swimming at this park. There are no lifeguards at provincial parks. This park has many opportunities for wildlife and nature viewing, including bird viewing in the waters around the Cleland Ecological Reserve, watching for migrating Gray whales and exploring the geological features of the park. These include ancient dune berms – rows of crescent-shaped sand mounds that indicate earlier sea levels. These berms can be seen along the historic telegraph trail. NOTE: Please abide to current DFO Marine Viewing Guidelines when viewing marine wildlife in BC Parks. There are six pit toilets located at Vargas Island’s most popular camping beaches. There are no designated campsites at this park, however wilderness camping is allowed. No facilities are provided other than six pit toilets and five food caches, located in popular camping areas. Vargas Island is accessible year-round; there is currently no winter camping fee, however a fee may be implemented in the future. Please practice “Leave No Trace” camping ethics.